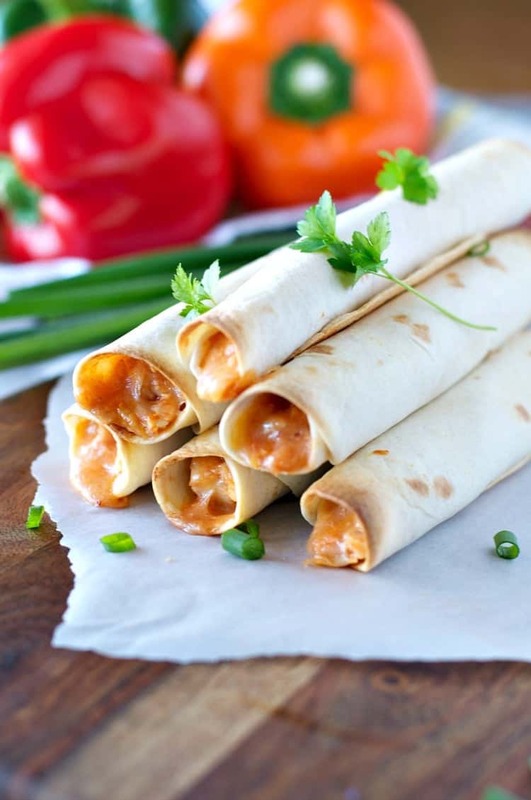 These chicken taquitos are utterly delicious and couldn't be easier to make! 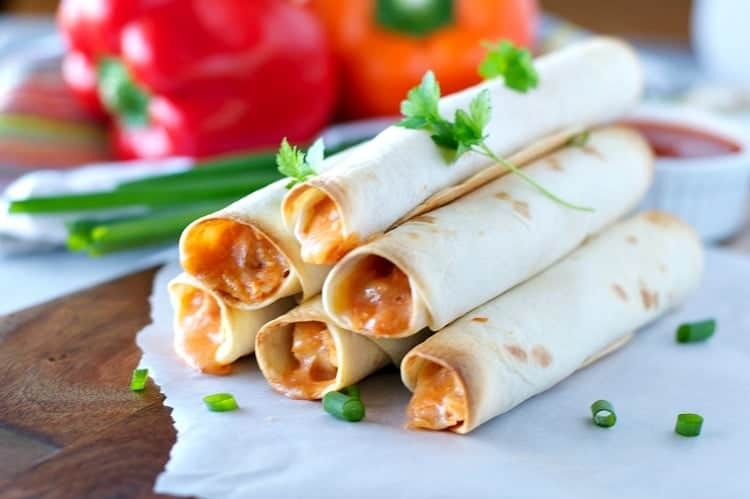 These Chicken Taquitos are an easy family-friendly finger food! You only need 4 ingredients and about 10 minutes to pull together this crowd-pleasing appetizer or light dinner! Does your family love taquitos as much as we do? 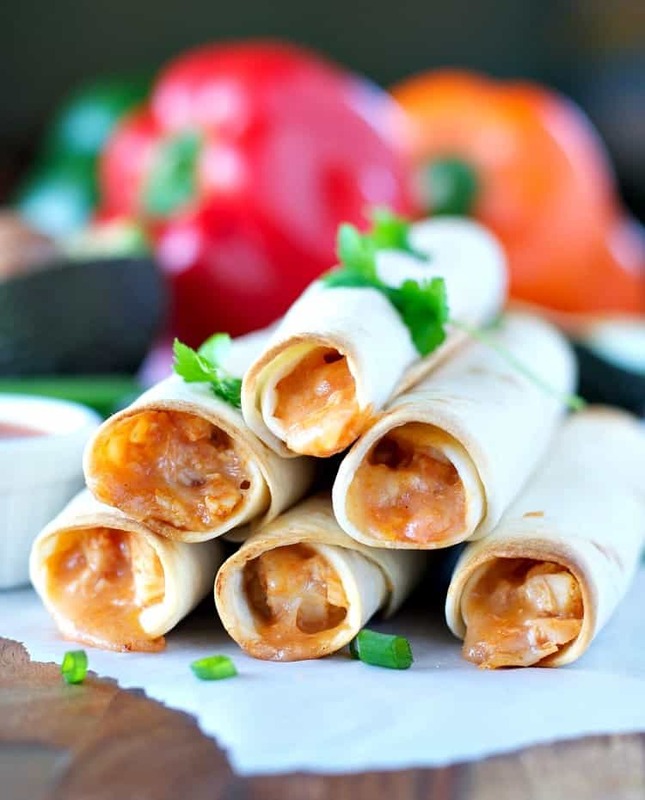 I have been making some version of these skinny, rolled-up tacos for as long as I can remember because they please everyone from my 2-year-old to my football-loving husband. Taquitos are not as messy as a traditional taco because the filling is baked tightly inside the rolled-up shell. Plus, their smaller size makes them ideal for little hands or for snack time munchies. They are the true definition of a crowd-pleasing recipe, and I just made them even easier with only 4 simple ingredients! 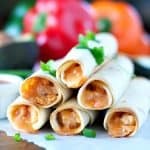 A classic taquito uses a corn tortilla, which I think tastes delicious; however, the corn tortillas also require quite a bit of finesse to get them rolled without ripping and tearing. Instead, I have found that small, soft flour tortillas work as an equally tasty substitute and they are much more durable! I’ve been known to stuff our taquitos with anything from ground taco beef to leftover shredded pork barbecue. It’s all good! But this particular recipe only requires a few high-quality ingredients that come together for a rich, cheesy, and zesty punch of flavor. And they really are the perfect Game Day snack — you can prep them ahead of time and keep them in your refrigerator or freezer until you’re ready to bake them; they don’t require utensils; and they taste great at room temp, too! Serve these to a group of hungry fans while they’re watching the big game and it will be an automatic touchdown! 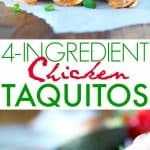 Along with some finely diced rotisserie chicken, I used our favorite mild salsa in this recipe (keeping the kids happy! ), and our go-to Sargento 4 Cheese Mexican blend. Sargento cheese is always 100% real, natural cheese, giving home cooks the confidence they need to create delicious meals using quality ingredients. Real Cheese People (like you and me!) know that real, natural cheese makes all the difference. No artificial ingredients here — thank goodness!! Sargento shredded cheese is cut off the block, every time. The brand is known for the best and most unique cheese blends, from 4 State Cheddar to 6 Cheese Italian, which help home cooks get even more creative in the kitchen. You guys, this delicious goodness is available in 30 different varieties, unique blends and distinct cuts! Sargento sliced cheese, which makes regular appearances on our sandwiches, is also cut off the block and 100% real and natural, giving grilled cheese, burgers and sandwiches the starring ingredient they deserve. In a large bowl, stir together chicken, cheese, and salsa. Divide chicken mixture evenly down the side of each tortilla. Roll up tortilla and place on a foil-lined baking sheet. When all tortillas are lined up on the baking sheet, spray tops with cooking spray to help them brown and crisp in the oven. Bake taquitos at 400°F (200°C) for about 15-20 minutes, or until crispy. 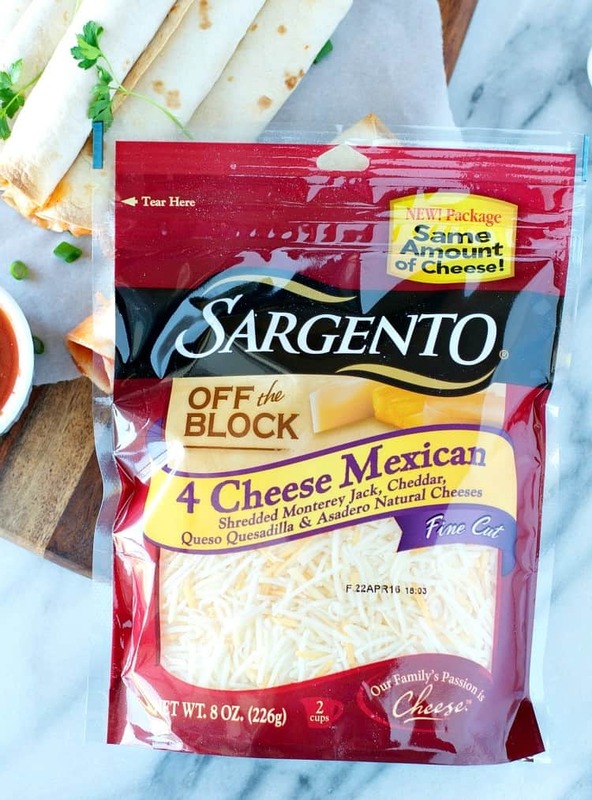 Be sure to follow Sargento on Pinterest for even more delicious and cheesy recipe ideas! We made these over the weekend & they turn out great. So simple too! Thanks! Awesome!! Thanks so much for letting me know, Doug! I’m glad that you enjoyed them — my family loves them, too! Perfect! Enjoy, Andrea! The beef will be delicious (ground beef also works)! Can I make these earlier in the day and then bake or would they get soggy? Hey, Paula! Yes, you can definitely prep them ahead and bake later — no problem! That’s often what I do! Another reader even froze them before baking, and she reported back that it worked well too! They were a bit spicy and difficult to prepare but my kids loved the flavor. We now make them on a weekly basis and my kids are always looking forward to it. Thanks for sharing. Hi, Scott! I’m so glad that your family has found a new favorite!